B-Tweets – The short film was screened on May 21 at Lokmanya Gratnhalaya on the occasion of 8th anniversary of United India Films. 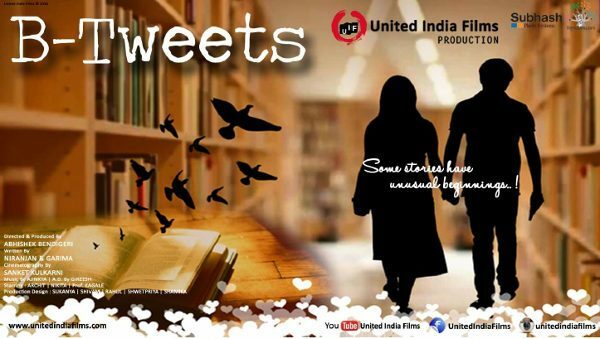 B-Tweets is a short story of two book lovers who date on the pages of their favorite books and how fate directs their love. While the world is leaning more towards technology, this movie is an attempt to increase the book readers in the society. The story revolves around two book-lovers who date on the pages of their favourite books anonymously. While the film attempts to bring back the reading habits of the yore to present, it also touches upon the necessities of technology to fetch us what we are looking for. Love comes in all forms. Shapes. Sizes. Faces. Sometimes, love comes gift wrapped in a new dress or an old song or a familiar fragrance. Sometimes, love finds its way through words. Inhale the scent of the yellowing pages, exhale the wisdom of their sayings and in-between, simply fall in love with love. Because, sometimes you can fall in love with souls instead of faces. Because, sometimes all love needs is words. Because sometimes, in love even 140 characters are enough! The shoot was entirely done at Lokmanya Grathalaya, Tilakwadi Belagavi. The film is directed and produced by Abhishek Bendigeri , Written by Niranjan Navalgund and Garima Behal, Cinematography by Sanket Kulkarni, Music Composition by Ajinkya Kudturkar, Assitant Direction by Gireesh Bharamshetty, Production Design team – Sukanya, Shamika, Shwetpriya, Shubham and Rahul Jain. The cast team includes – Archit Sharma, Nikita Bajaj , Jasmine Kaur and Professor Kagale. The film is supported by Shishira Bhat Foundation, bengaluru. ; Subash Photosystems, Belgavi, Venudwani 90.4 FM and KLE school of music are some of our supporters. The film was screened at Lokmanya Gratnahlaya on 21 May , Saturday. On the occasion of United India Film’s 8th anniversary and the function was presided by Mr, Sarjoo Katkar, Mr. Deepak Oulkar, Mr. Lingaraj jagjampi and Mr. Santoshraj Zavre (Actor) were present. – United India Films celebrates its 8th year anniversary this season. – Born in 2008, United India Films is a production house which caters to all the demands of the industry in the field of production. With an in house team of producers, writers, programmers, researchers, animators, directors and cameraman, UIF is the wholesome solution to any of your production needs. It was back in February 2013, United India Film’s Vande Hejje – a Kannada film was awarded as the best short film at Good Deeds Film Festival, New Delhi and we are expecting great response from B-Tweets as well. – United India Films is a creatively driven media company that is comitted in creating rich , meaningful and thought provoking content. – The brain behind UIF, Mr. Abhishek bendigeri the founder of UIF is also at the heart of this initiatve with sachin deshpande, sandesh honnati and chiranjivi paatil as co-founders. The interesting part is all are engineers by profession and film making is passion that has kept UIF growing and this season its been 8 years we are stepping into.